Diablo Lake is located along State Route 20, the North Cascades Highway. This has been one of the must-see places in my travel list and got a chance to visit during the July 4th weekend. 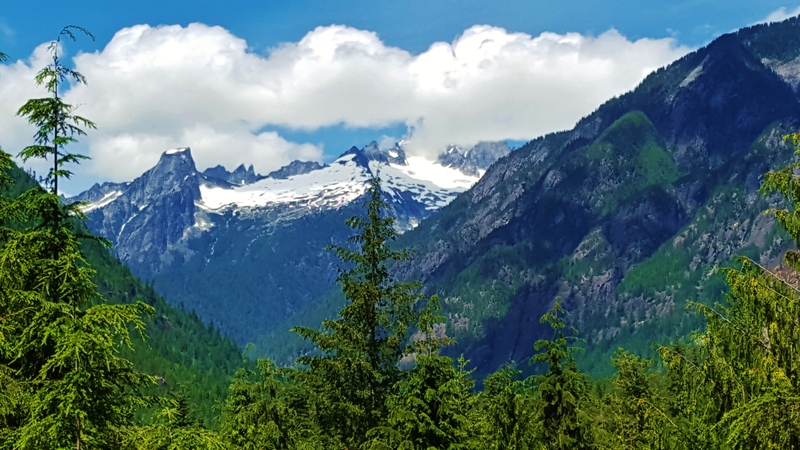 The diverse magic of the North Cascades with it’s beautiful peaks, lush forests begins as blue green waters are stored in the mountain glaciers and snow pack. 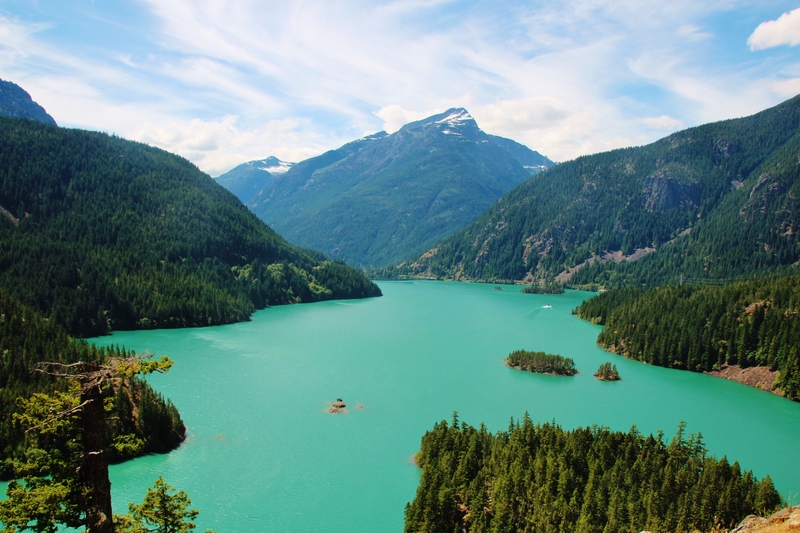 There are so many activities that you can do in North Cascades National park that includes hiking, camping, kayaking and many other outdoor water activities. We did a one day trip to the North Cascades just to visit the Diablo Lake and hike down some of the surrounding trails in the Cascades area. Diablo Lake receives the flow of many glaciers, including North Cascades National Park’s. The gorgeous green color is caused by rock particles eroded by the ice and is simply a delight to view the color of the lake. Diablo Lake is outside of North Cascades National Park, but inside the Ross Lake National Recreation Area. Before you drive towards the lake, it is recommended to visit the North cascades visitor center which is 10 miles away from the Diablo Lake. The Visitor center is pretty spacious and there are ranger led programs inside the center if you have young explorers visiting. The Visitor center has good sit out places and you can also get to take a short stroll to view the Picket Range. 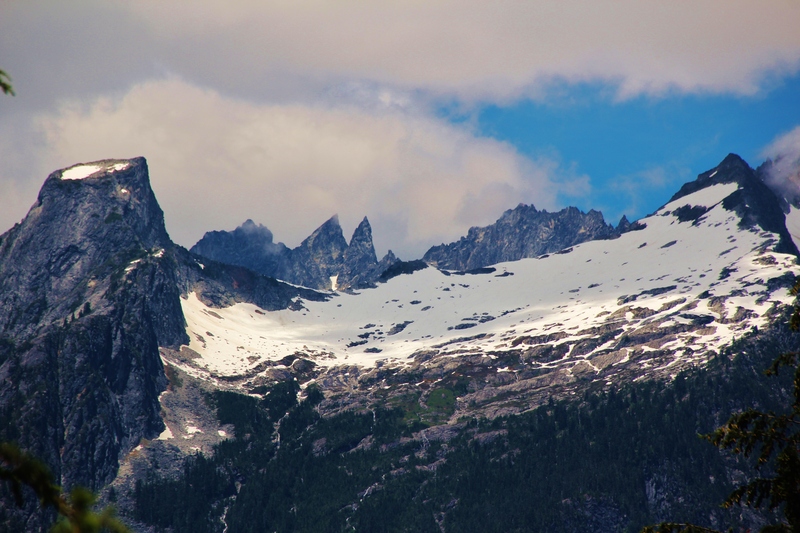 Heading from North Cascades National Park Visitor center, there are really very good stops that one must not miss. The Gorge Creek Falls is one of the stop that is on the road-side State Highway-20. You will get to see the Gorge Creek Falls on one side and the view of the lake on the other side. 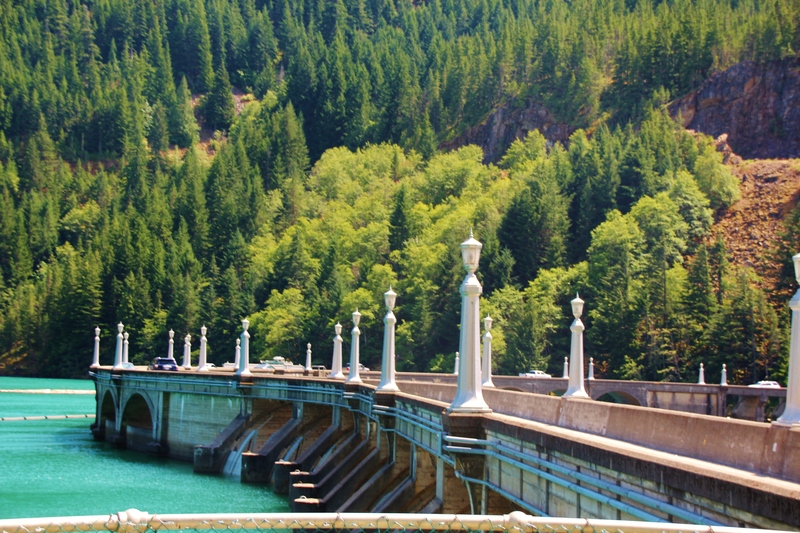 Diablo Lake Dam Road is another great destination visit before you visit the Diablo Lake Overlook point. If you are interested to do boat tours or hike down the lake, you will need to take the Dam Road to access these sites. This is a one way dam road, so you must watch out for other cars in the dam and cars are not allowed to be stopped or parked in this dam road. This is the one of the most crowded spot and you will see many photographs being captured at this place. 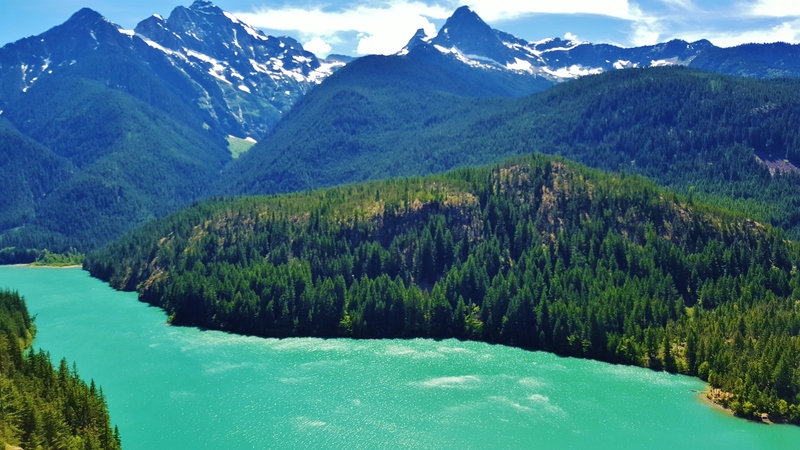 You will get to experience the full view of the Diablo Lake and feel the wilderness surrounding you especially the majestic mountain peaks, evergreen rain forest and the beautiful turquoise lakes. 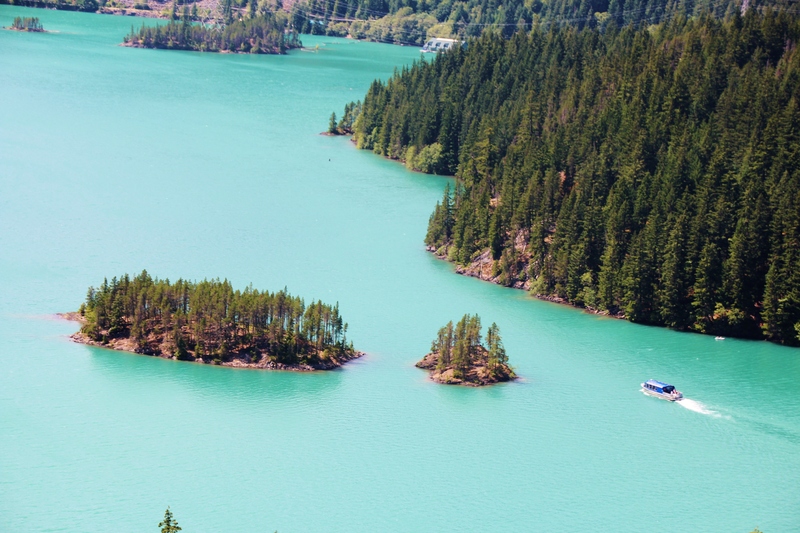 4 Responses to "Diablo Lake"
A great Post.. Beautiful Pictures of the Lake! A little forested knob perhaps 100 feet high protected the campsite from the wind’s full force, and when we climbed it to take in the view of the whole lake, the wind howled around our heads at easily 30 knots.